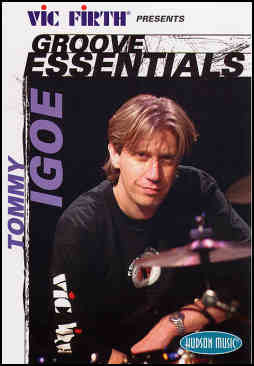 Groove Essentials is a DVD based on the collection of Rock, Jazz, R&B/Hip Hop, Funk, and World Ethnic drumming styles from the poster of the same name that was originally developed by drummer, teacher, and author Tommy Igoe along with Vic Firth drum sticks. Like the poster, which is included, the DVD covers forty-seven of today's most popular drum patterns designed to help you become a more well-rounded drummer. Let's check it out. Throughout the DVD Tommy demonstrates each groove, building them one limb at a time. He also points out the 'connective tissue' of each groove, which is the main rhythmic pattern that binds a groove together. Tommy then plays each groove at slow and fast tempos in a musical context and includes the usual fills an experienced drummer would play. Opening Comments: Tommy discusses and defines the term Groove and its various meanings in music and offers advice on how best to use the DVD as a learning tool. The DVD was produced with chapter markings on each of the forty-seven grooves so that you can quickly find exactly what you want to practice using your DVD's remote. Rock Grooves: This segment covers 8th note and 16th note rock grooves along with two half-time feels. Funk Grooves - Although this segment contains only three grooves, Tommy recommends listening to Funk drummers as a good way to delve further into Funk. R&B/Hip Hop Grooves - Includes quarter note and sixteenth note based grooves. Jazz/Swing Grooves - Tommy explains the basic Jazz/Swing Ride (or Time) pattern and the feathering technique used on the bass drum. This segment includes patterns in 4/4 time with the left hand comping on the snare, the basic jazz shuffle, a two-feel on the hi-hat and the jazz waltz in 3/4. Tommy also demonstrates some brush technique on the snare drum. World, Ethnic, & Specialty Grooves - This segment includes Disco, Classic Two-Beat, New Orleans 2nd Line, Reggae, Calypso, Soca, Bossa Nova, Slow Samba, Fast Samba, Baiao Samba, Batucada, Merengue, Cha Cha Cha, Bolero, Mambo, Songo, Nanigo, Mozambique, Salsa, Tango, and Beguine. Bonus Features: Include Web links, a bio on Tommy Igoe, & info on Hudson Music and Vic Firth. When I was starting out on the drums, I had the opportunity to play at all of my school dances and Battles of the Bands. I also played countless weddings and club dates where I was expected to know how to play many of the styles that are covered on this DVD. Thanks to the quality of instruction provided by my first drumset instructor, I had no problem cutting any of the styles. But things are different today. Since the advent of the DJ, live music has taken a back seat and many drummers don't have the same opportunities to learn and use various drumming styles in live situations. If you are unfamiliar with the majority of the drumming styles listed above, then this DVD is for you. Tommy does a great teaching job on it, offering valuable tips to help you learn play each style in an authentic manner. And by following his recommendations, you'll soon feel right at home playing any of the forty-seven included drumming styles. I highly recommend it for any DrumHead, beginner or pro, who is looking to expand his or her stylistic horizons.